This is the weekend when most of France seems to get up, take to their vehicles and head off on their holiday/vacation. Comme d’habitude [as usual], it is also the weekend that we start heading home. Fortunately, most of France was on the autoroutes heading south; the south bound carriageway on our A20 autoroute was three lanes of stationary traffic at a few . We, on the other hand, were heading north and had the advantage of very light traffic indeed. 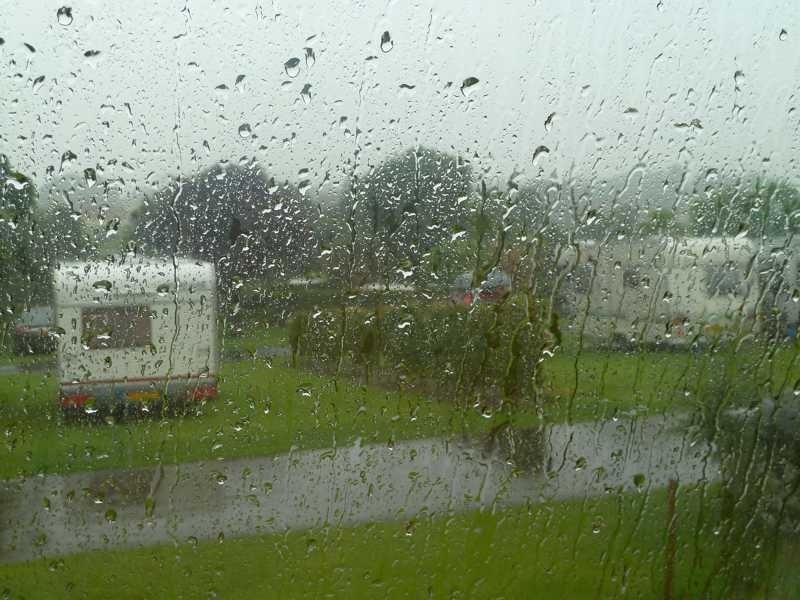 The weather in northern Europe seems to have been pretty much total crap since the beginning of June. Britain has certainly been suffering, from what we’ve heard, and so has much of northern France. To repeat Gerard’s quote from the Marais Poitevin, spring was a “catastrophe!”. Summer hasn’t started any better. Since we returned to the top half of France, it’s certainly been unsettled. The saving grace for those poor Parisians pointing south while remaining stationary on the A20 is that the extreme south is the only spot enjoying anything resembling summer weather. Heading north, the skies continued to darken and at Chartres, the rain began. This was not a summer storm sky, this was a solid mass of unbroken grey (various shades but mostly dark) from horizon to horizon and all but on the deck; there was no break. For those heading north, the only saving grace was that the traffic was light. Miraculously, a rare, brief respite in the rain coincided with our pitching up at Neufchâtel-en-Bray and we didn’t get too wet. It was short lived, though. As we shopped in the local Leclerc supermarché, I thought a machine had suddenly been switched on but it was rain hammering on the roof. We returned to Guillaume with our booty. Here’s a couple of shots from our windows. You may know that I always blur other folks number plates so as not to provide identification information. You’ll see from the first shot that resorting to Photoshop Elements was unnecessary – the rain has blurred everything for me. Here’s as close to artistic as I can get in such conditions. This picture, resembling the cover one of the earlier (and great) Peter Gabriel albums, is a river running down one of Guillaume’s side windows. 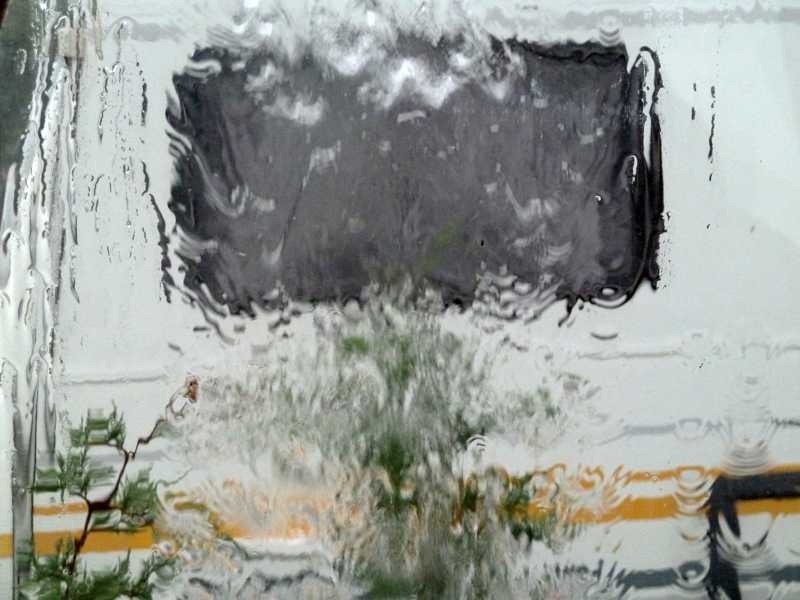 The unfortunate Dutch owner of the caravan blurred by Guillaume’s river, was trying to get set up in this. Summer’s been cancelled in Britain for the last couple of years. Every time I mutter something along the lines of, “it can’t get worse than this”, it proves me completely wrong by doing so. I won’t say it again.